Mounts easily with removable self-adhesive backing. Allows quick access to your favorite CDs/DVDs. Movies, Music, Software, Games, Media Storage and more! 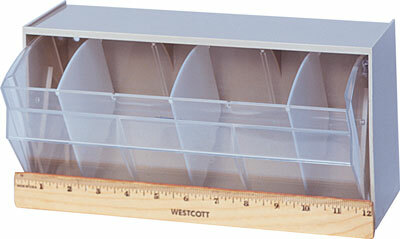 Fits any letter size file drawer in desks or file cabinets. Secures and protects confidential data inside locked file drawers. Mounts quickly and easily with removable self-adhesive backing! 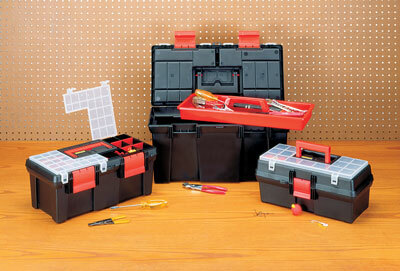 These unique, heavy duty tool boxes effectively transport, protect and store your tools and small parts. Available in three sizes (14", 16" and 20") Easy to carry and store. Lift out tray with carrying handle. 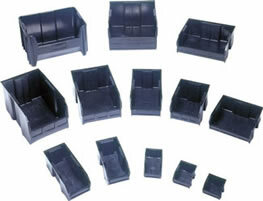 Injection molded from break resistant copolymer polypropylene for tough, industrial use. 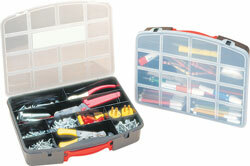 Built in organizer provides vicinity to multiple compartments. Full interlocking hinges and padlock eye for security and safety. Wide rounded carrying handle for easy handling. 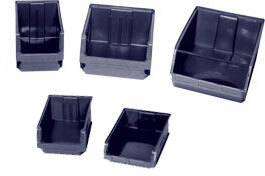 Large, wide plastic latches provide tight closure. Built for durability and rough handling. Available in black. 7- 1/2" x 14" x 6- 1/8"
8- 3/4" x 16" x 6- 5/8"
9- 3/4" x 20" x 9- 1/2"
QB900 10- 1/4" x 13" x 2- 3/8"
MAGNUM Bin Units Complete Packages. Five combinations allow you a wide selection to choose from. 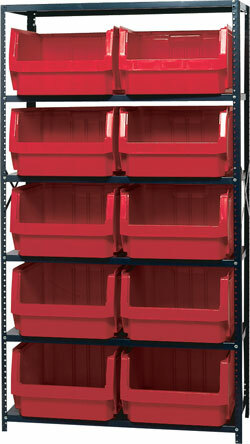 Bins offer optional clear window fronts as well as dividers for maximum storage capacity. Shelving is tough 42” wide with a 475 lb. load capacity per shelf. Smooth powder coat finish which will not rust or corrode. Bins are available in Blue, Yellow, Green, Red and Black. Please specify color. One color per unit. 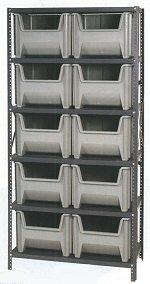 Twelve QSB 100, 100 eight QSB 101, five, QSB 102, four QSB 107, three QSB 109 fit across a standard 36" wide" x 12" deep shelf. 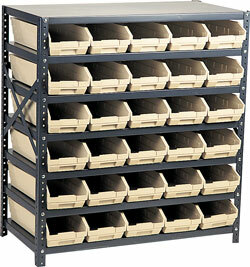 Eight QSB 103, five QSB 104, four QSB 108, three4 QSB 110 fit across as a standard 36" x 18" deep shelf. 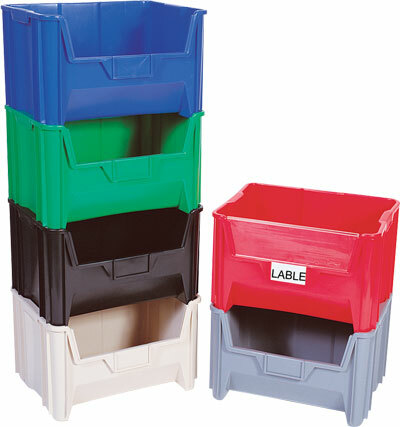 Manufactured from recycled, 100% post consumer, high density polyethylene, these bins come in a complete range of sizes and have all the features of Quantum’s standard bins at a more economical price. Available in Black only. QUS 210BR 5- 3/8" x 4- 1/8" x 3"
QUS 220BR 7- 3/8" x 4- 1/8" x 3"
QUS 224BR 10- 7/8" x 4- 1/8" x 3"
QUS 230BR 10- 7/8" x 5- 1/2" x 5"
QUS 233BR 13- 1/2" x 4- 1/8" x 5"
QUS 234BR 14- 3/4" x 5- 1/2" x 5"
QUS 235BR 10- 7/8" x 11 x 5"
QUS 239BR 10- 3/4" x 8- 1/4" x 7"
QUS 240BR 14- 3/4" x 8- 1/4" x 7"
QUS 245BR 10- 7/8" x 16- 1/2" x 5"
QUS 250BR 14- 3/4" x 16- 1/2" x 7"
QUS 255BR 16" x 11" x 8"
QUS 260BR 18" x 11" x 10"
QUS 265BR 18" x 8 1/4" x 9"
QUS 270BR 18 x 16- 1/2" x 11"
QUS 280BR 19- 3/4" x 12- 3/8" x 5- 7/8"
QGH 700BR 15- 1/4" x 19- 7/8" x 12- 7/16"
QUS 101BR 11- 5/8" x 4- 1/8" x 4"
QUS 102BR 11 - 5/8" x 6- 5/8" x 4"
QUS 107BR 11- 5/8" x 8- 3/8" x 4"
QUS 109BR 11 - 5/8" x 11- 1/8" x 4"
QUS 103BR 17- 7/8" x 4- 1/8" x 4"
QUS 104BR 17 - 7/8" x 6- 5/8" x 4"
QUS 108BR 17- 7/8" x 8- 3/8" x 4"
QUS 110BR 17 - 7/8" x 11- 1/8" x 4"
QUS 105BR 23- 5/8" x 4- 1/8" x 4"
QUS 106BR 23- 5/8" x 6- 5/8" x 4"
QUS 114BR 23- 5/8" x 8- 3/8" x 4"
QUS 116BR 23- 5/8" x 11- 1/8" x 4"
QMS 532BR 19- 3/4" x 12- 3/8" x 7- 7/8"
QMS 533BR 19 - 3/4" x 12- 3/8" x 11- 7/8"
QMS 543BR 19- 3/4" x 18- 3/8" x 11- 7/8"
QMS 743BR 29 x 12- 3/8" x 11- 7/8"
This double open sided bin provides front and back access to stored parts. 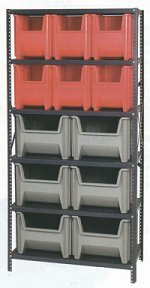 These heavy-duty, polypropylene storage bins provide an open hopper front and back, allowing double access to stored parts. Bins stack one on top of the other, both vertically and cross wise and nest when empty for space efficiency. 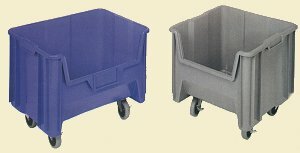 Optional dividers may be used front to back, side to side or both at the same time, dividing the bin into four sections. A molded in label holder on both the front and back of the bin allow for easy parts identification. 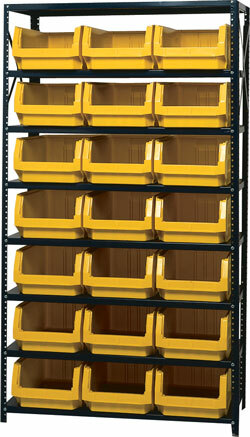 Bins can be used on standard metal or wire shelving as well as on desks or bench tops. Available in Black only. 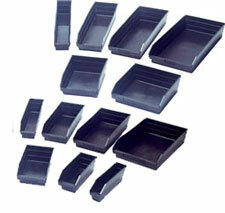 QP1265BR 12- 1/2" x 6- 5/8" x 7- 5"
QP1285BR 12 - 1/2" x 8- 3/8" x 11- 5"
QP1496BR 14"- 9" x 1/4- 6" x 11- 1/2"
QP1867BR 18- 1/2"- 6" x 5/8- 7"
QP1887BR 18- 1/2"- 8" x 3/8- 7"
Giant Stack Container and Container System Multipurpose, wide open hopper front provides easy access for large part storage. 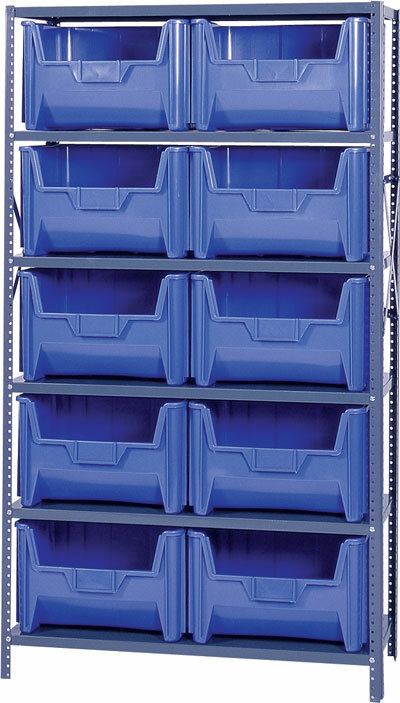 Ideal for multiple applications in recycling, storing parts, tools and warehouse items. 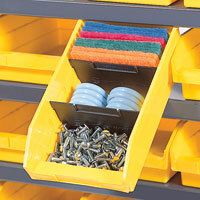 This bin will stack up to 6 bins high creating a sturdy, tall storage system. Injection molded from high density polyethylene, easy to clean, resists rust and corrosion and most chemicals. Large label holder for quick identification. Optional clear window increases storage capacity and allows for inspection of parts. Optional, six 1/4” drill holes on bottom of bin allow for drainage. Available in Red, Gray, Blue, Green, Ivory and Black. Please specify color. • QGH705MOB, with casters, overall height is 15-13/16"
• QGH805MOB, with casters, overall height is 15-3/4"
Bin Storage Center- Complete Package with bins! 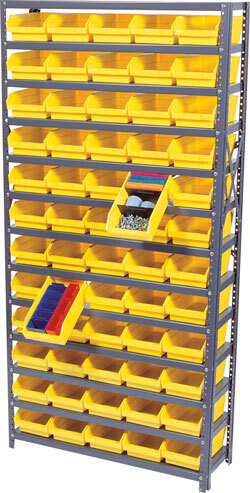 Organize, store and access your medium or large parts with this high capacity 10 bin center. 475 lb. 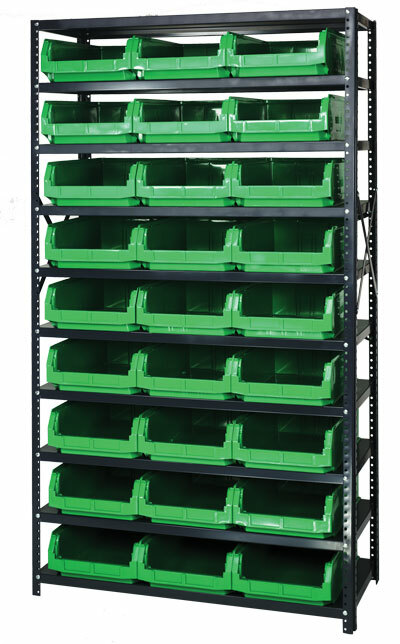 capacity per shelf and over 21 cubic feet of storage capacity. Smooth powder coat finish and cross bracing for increased stability. Easy assembly. 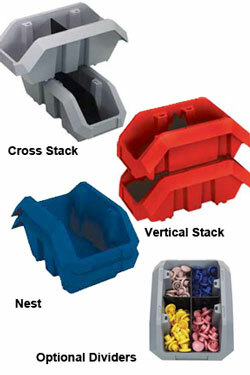 Bins available in Red, Gray, Blue, Green, Ivory and Black. Please specify color. One color per unit. 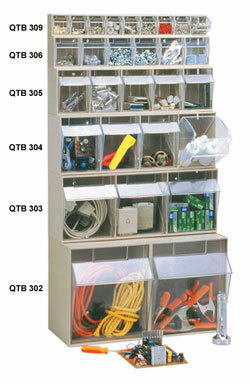 Double open sided bin provides front and back access to stored parts. 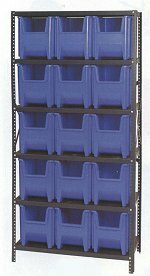 These heavy-duty, polypropylene storage bins provide an open hopper front and back, allowing double access to stored parts. Bins stack one on top of the other, both vertically and cross wise and nest when empty for space efficiency. Optional dividers may be used front to back, side to side or both at the same time, dividing the bin into four sections. A molded in label holder on both the front and back of the bin allow for easy parts identification. 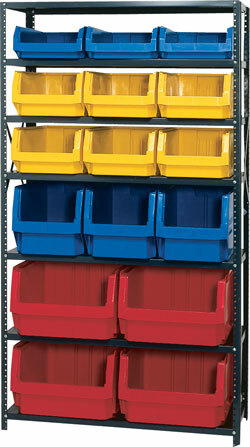 Bins can be used on standard metal or wire shelving as well as on desks or bench tops. Available in 6 sizes and in 6 colors: Blue, Gray, Yellow, Red, Green and Black. Please specify. 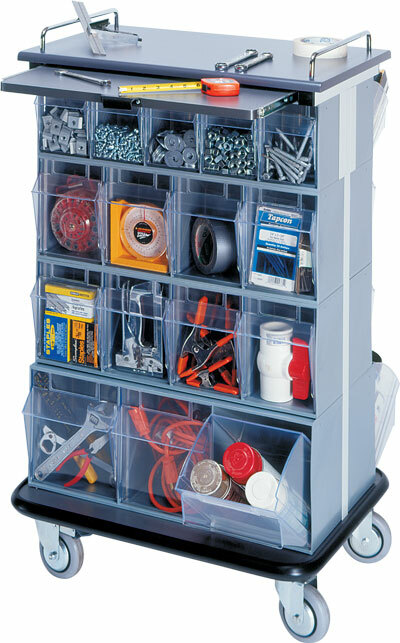 Space saving bin units keep small and medium sized parts organized, sorted and easy to find. These clear, break resistant injection molded plastic containers tip open smoothly to a 45° angle and are completely removable for easy access and refilling. Molded handle with slots for labels provided. Bins are easily cleaned with soap and water. Polystyrene cabinet can be stacked or wall mounted. Exterior available in White, Ivory and Gray. Please specify color. Cups available in clear. QTB 302 11- 7/8" x 11- 23- 5/8" x 13- 7/8"
QTB 303 7- 3/4" x 23- 5/8" x 9- 1/2"
QTB 304 6- 5/8" x 23- 5/8" x 8- 1/8"
QTB 305 5- 1/4" x 23- 5/8" x 6- 1/2"
QTB 306 3- 5/8" x 23- 5/8" x 4- 1/2"
QTB 309 2- 1/2" x 23- 5/8" x 3- 1/8"
Comes complete with one 5-bin two 4-bin units and one 3-bin unit on use.